The Redrock Micro DSLR Field Cinema Deluxe Bundle Black with Advanced microFollowFocus is a complete rig to support HDSLR cameras with external monitor. Compatible with most HDSLR cameras with or without battery grips, the Cinema Deluxe Bundle enables you do professional-style cinematography. The included DSLR baseplate mounts your DSLR camera on rails, and a microMount allows you to attach a monitor to the rig. The external monitor helps a camera assistant to precisely pull the focus while the cameraman concentrates on framing. The C300 EVF Recoil rig includes the VCT Universal Baseplate. Inspired by traditional ENG cameras, it truly is the last baseplate you’ll ever need. Instead of a standard handgrip we’ve included the Zgrip Relocator for the Canon C100/300/500. 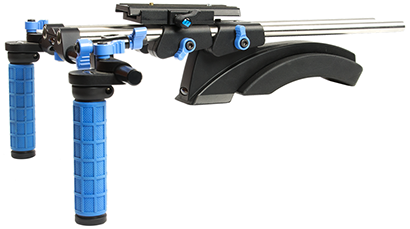 This articulating grip incorporates the camera’s removable control grip, moving it forward and down to a comfortable handgrip position. The included C300/500 Helmet Kit with the Recoil Handle mounts directly to the top of the C300/500 in place of the Canon top handle and offers multiple threaded accessory mounts.